I am in the process of revising a recent discussion paper I have published on the tectonic evolution of the South Atlantic rift system. So I started to collect some information from various papers to back up and supplement an alternative plate tectonic scenario. 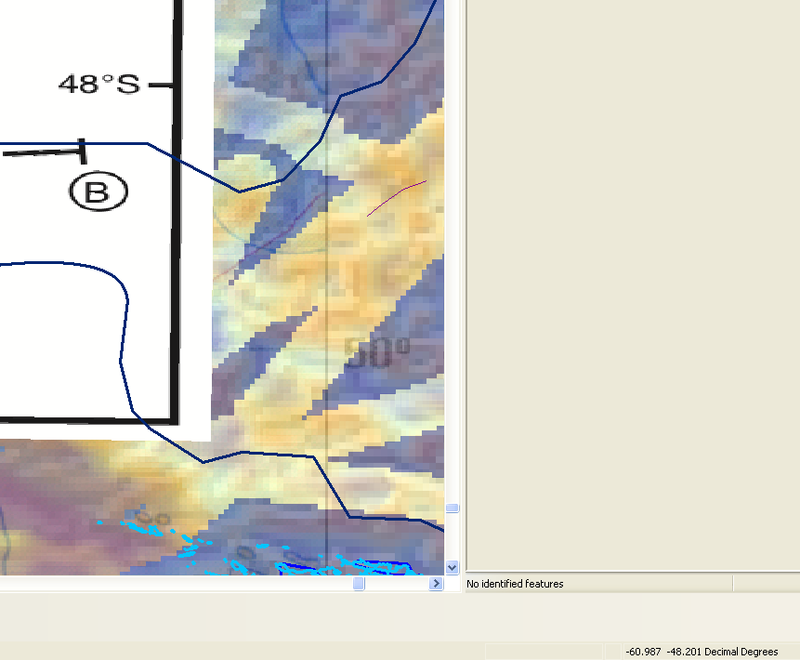 Unfortunately there only one or two key papers on this remote offshore region on the Argentine margin (not a prolific basin to drill for hydrocarbons), so what I usually do in that case is to take a screenshot of the relevant maps in that paper and georeference them. Once this is done, one can add extra information into the files I am using in GPlates for my reconstructions. Georeferenced overview map. 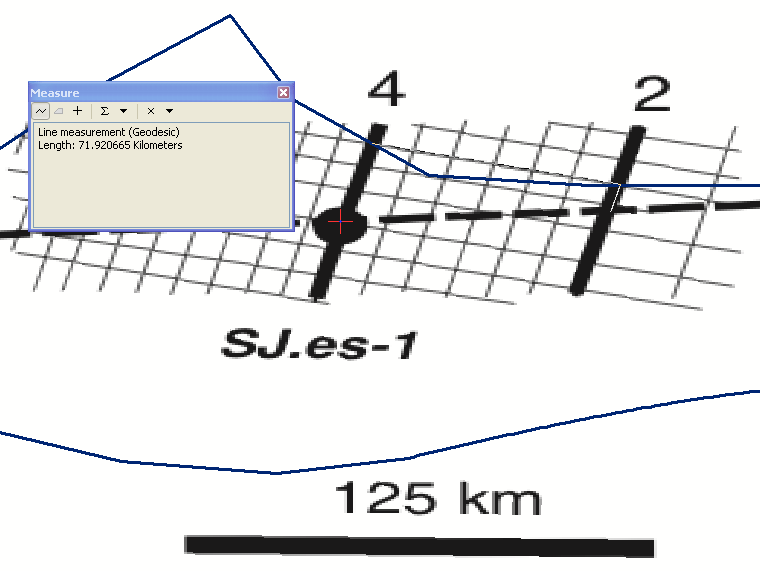 Scale dimension are not too far off: 128 km measured in the GIS vs. 125 km long scale bar. 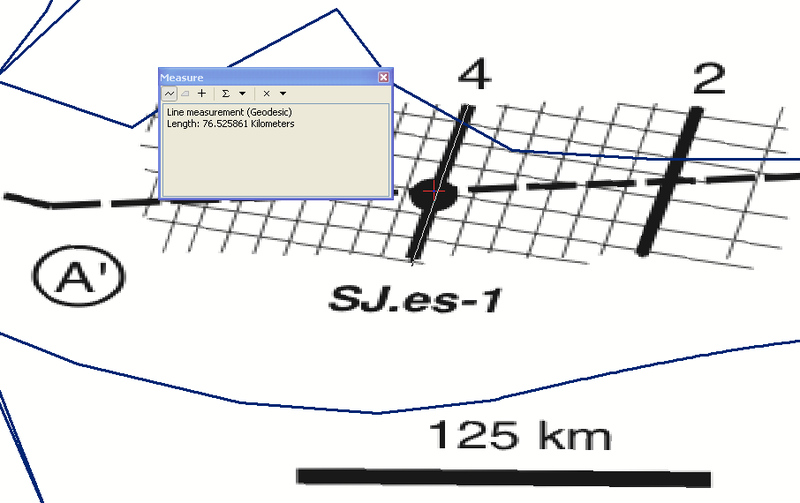 Seismic line dimensions – 75 km long. So far so good. 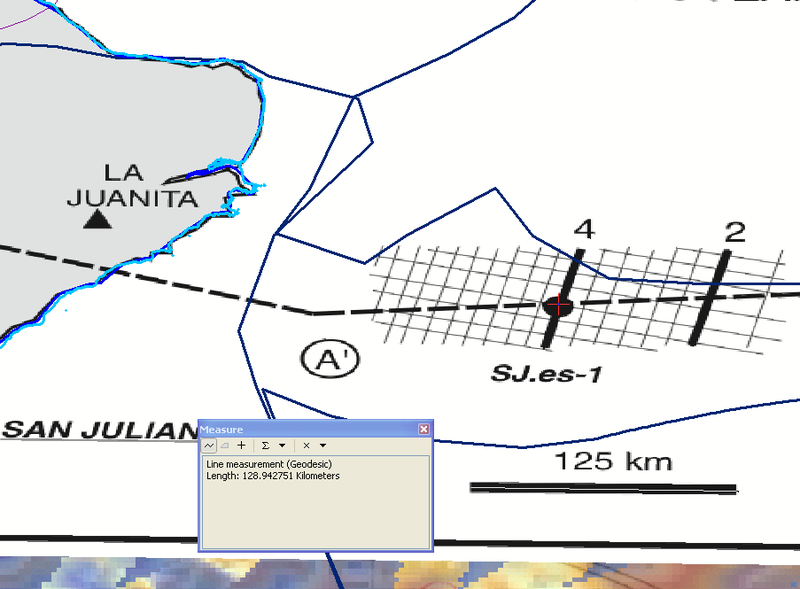 Seismic line spacing between SL4 and SL2 is about 70 km according to the georeferenced image. The structural map (modified from original). Seismic line spacing around 40-50km (not 70 km like in the overview map) and the lines are slightly rotated relative to each other and not parallel (like in the overview map). 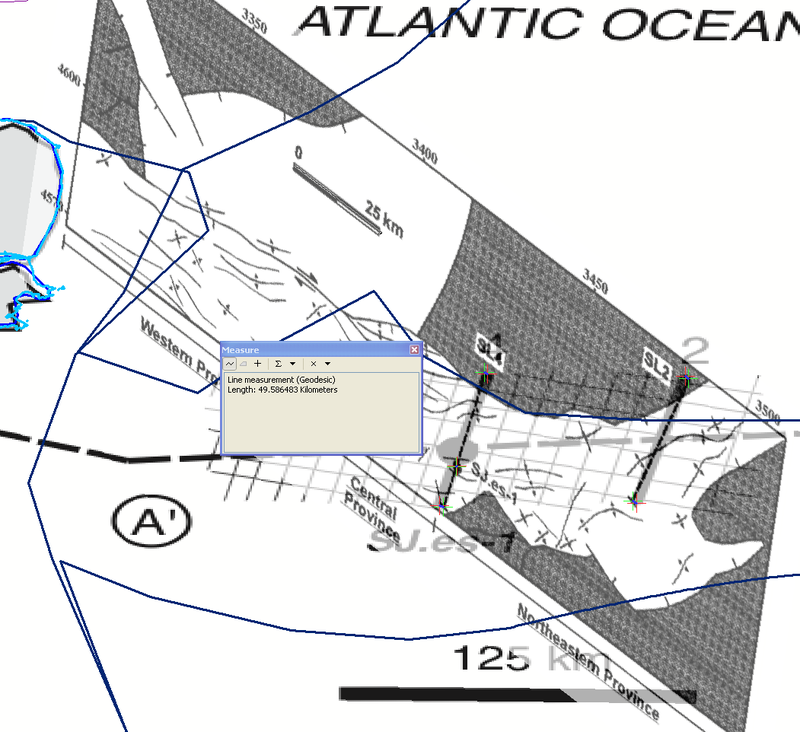 Georeferenced structural map (40% transparent) based on the seismic lines and the well location as provided in the overview map placed on top of the overview map (non-transparent). Scaled and rotated structural map (transparent, on top of overview map) with a best fit to the overview map. Note the mismatch not only in the way the lines are rotated (could be due to the different projections) but also the distance between the the two seismic lines in the overview map (more than 70 km) and in the structural map. This time, I scaled the map to match the length scale (25.9km vs 25 km stated in the map) and then rotated the image with the SJ.es-1 well as control point. So it seems that the overview map does not show the correct information – either the lines are wrongly indicated (ie not full length, not the right lines), or the line locations on the structural map are wrong. Simply, there is no (easy and straightforward) way to get the line locations in the overview map to match those in the strutural map which is a basic breakdown of scientific reproducibility… Sadly this means that the information in the structural map cannot be utilised by other people (like me) who try use it. I can understand -to a degree- that geoscientists have a tendency to obscure their data by chosing map projections which make it harder to reverse engineer the information contained in the maps. But there is a difference between publishing a “hard to reverse-engineer” map and a plainly wrong map. 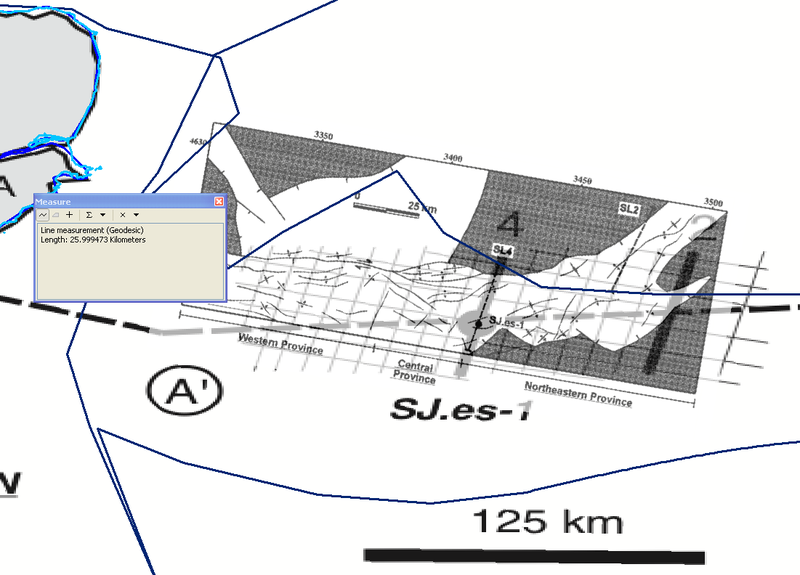 This entry was posted in Geospatial and tagged Scientific publishing on 22/03/2013 by Christian.